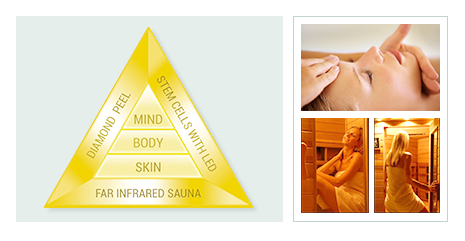 Veronica skin care and medical spa in Malibu, California is dedicated to a healthy, relaxing environment. We specialize in the study of beautiful skin and offer you the finest treatments in skin and body care. This beautiful beachside day spa and medical spa offers an exclusive atmosphere and a rich selection of skin and body care therapy. Veronica’s staff of skin care experts, including estheticians, nutritionists, acupuncturists, RN’s and doctors will help you look your best. We strive to offer you personalized treatments and the best skin care products available today. A beautiful facial from Japan using 24 Karat Gold, Gama PGA and Nano Mist technology. This treatment lightens, brightens and hydrates the skin, leaving it firmer and more youthful! This rejuvenating treatment begins with a Far Infrared Sauna to detoxify, remove toxins, improve immune system, burn calories and improve skin. Next the client has a rejuvenating Diamond Peel to exfoliate the skin on the face and decollate . The skin is then drenched with Ovine Stem Cells, vitamins and gold. Then the client is placed under the Omnilux LED Light to further penetrate the stem cells, and stimulate elastin and collagen. Far infrared waves penetrate into the body to activate the sweat glans. The sweat glands offer one only a few mechanisms that the body has to eliminate toxins and since the skin is the largest organ in the human body it is apparently a very good mean for elimination. Far infrared is the longest wavelength which penetrates the fat cells causing vasodilation, where the fat cells vibrate to expel toxins, resulting in the greatest levels of detoxification and stimulate your metabolism to aid in weight-loss. An Aromatherapy Facial is the ultimate stress and tension reliever. Nourish the skin with pure essential oils for your skin type, restore elasticity and replenish moisture. Reduces stress, while promoting relaxation and internal well-being. Every inch of skin is buffed, first with diamond tome exfoliation (the newest microdermabrasion) and glycolic acid. Next is anti-aging photo-modulation, during which L.E.D. lights flash a thousand service_times to stimulate collagen. The refreshing 02 Oxygen facial, tightens and hydrates with hyaluronic acid, removing dark circles, and plumping out lips. Now, you have the glow! A deep pore cleansing with warm steam prepares the skin for extractions and the delivery of pure essential oils for your skin type. A facial and neck massage and restorative masque complete the treatment, leaving the skin radiant! Ideal for most skin types. A unique serum delivery system that addresses specific skin concerns. A multi-step treatment cleanses exfoliates and extracts to get rid of impurities and dead skin cells while at the same time quenches the skin with vital nutrients like antioxidants, peptides and hyaluronic acid. The results are both instant and long-lasting. Same as the european with no massage and less extraction time. Our lunch time facial. This unique treatment incorporates the use of mild galvanic currents, nourishing gels and massage for total rejuvenation of the complexion. Applied in two stages, detoxifies and reduces puffiness by stimulating lymphatic drainage, then tightens slack skin and muscle tone. Recommended as a series of six weekly treatments for toning and firming. The power peel microdermabrasion system is an intense exfoliation process that rejuvenates the skin by utilizing ultra-fine aluminum oxide crystals to remove the upper layer of the stratum corneum. At the same service_time, the hand piece contains a vacuum tube that sweeps up both the crystals and the skin’s cellular debris. This buffs the skin of fine lines and discoloration while refining texture and hue. Excellent for scar revision (acne, chicken pox, or even surgery scars) as well as discoloration and melasma. Erases epidermal layers at varying depths in a controlled manner. It mechanically alters the epidermas and invigorates cell renewal to create a healthy, balanced skin surface. An enzyme protein facial that speeds up cellular activity of surface cells so that the dermis becomes self-rejuvenating. A third mask can also be applied. Oxygen, vitamins and hyaluronic serum combine under hyperbaric pressure to deliver unparalleled hydration and age defying results. A calibrated device designed to spray hyaluronic serum, oxygen and vitamins onto the skin. All skin types benefit from this treatment. You will see results after only one treatment. More dramatic and longer lasting results are achieved after multiple treatments. Atoxiline can be added if you wish for an added boost of hydration. Introducing the most advanced gold stem cell facial using nutrient rich stem cells. The stem cells provide exceptional results by transferring large numbers of bio-active cells directly to the dermis of the face. When applied in sufficient concentration, the stem cells “de-age” the skin. The revitalized, younger skin cells immediately begin producing increased levels of collagen, glycoproteins, and elastic fibers in the skin’s extra cellular matrix as they did in the past. The “de-aging” effect is cumulative. This facial is followed with LED Lights to activate the nutrients into the dermis. Deep pore cleansing, surface exfoliation and skin softeners prepare in the extraction of impurities. Pressure point massage when needed calms the skin and boosts the healing abilities of the skin. An antibacterial masque soothes and calms inflamed skin and an oil free moisturizer and sun screen is applied. This facial concentrates on problems facing teenage skin. Removing impurities, soothing inflamed skin and educating teens about their skin is our main focus. We will assist in designing a home care routine to teach about proper skin care and sun protection. Revitalize your skin with light! L.E.D. therapy firms, refines and calms your skin without any downservice time! Gentle red and infrared lights decrease inflammation and boost your skin’s natural collagen and elastin proteins, leaving your skin soft and beautifully refreshed. This treatment is highly recommended for healing and soothing the skin. Glycolic acid is a natural substance derived from sugar cane. This treatment removes dead skin cells, increases circulation and stimulates healthy cell growth and wrinkle reduction. We wax, tweeze, trim and shape brows with an artful eye leaving them looking natural. Waxing not recommended for clients on accutane, retin-a or who have had laser or chemical peels. Combing strong and gentle touches, our therapist will tailor the treatment to your needs. Swedish massage is very effective in relieving soreness, muscular tension, and stress. It also helps to increase your circulation. This massage uses regulated pressure to release tension from the body. Athletes and those in need of a stronger touch will find the relief they need to help with muscle regeneration and circulation. Based on an ancient Chinese technique, this relaxing treatment is very effective in relieving stress. Pressure is applied to reflex acupressure points of the feet to restore the flow of energy throughout the body, and stimulate the body’s self-healing abilities. Peels, Vitamins, supplements, and Specialty product add-ons are available for special needs and desires. They can be added on to any facial treatment for an additional fee.